Today we have Nicole from Sixty Nine Oh! Four showing off her beautiful home. Nicole is also a new Mommy to one month old Luke who is absolutely adorable!!!! Thank you Nicole for welcoming us into your beautiful home!!! Hello, I am Nicole and welcome to my blog -- Sixty-Nine oh! Four. I am excited to take you on a virtual tour of our home. We have lived here just a little over a year and a half. My husband Taylor and I picked out our lot and were so lucky to be able to have our home built by a custom builder in our area. We have had a great time with various DIY projects, decorating and making our house into a home for our little family. Our family just had a new addition 6 weeks ago and his name is Luke. Back to the reason you are all here... Our home. and thank you to Karen for having us as her guest! Congrats on your new baby boy!! Beautiful Home!! I have the same dresser that you have in your guest room! it was my Mom's growing up and I had a child and now my littlest girl has it! So neat!!! Wow-- I found that dresser at my local antique store... that's so neat that you passed it on to your daughter! Thanks! 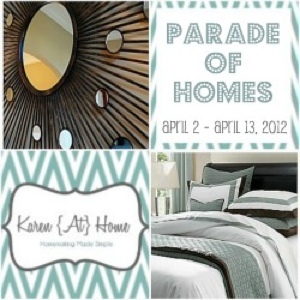 Thanks for hosting this parade of homes, I love looking into other people's homes (and lives!). The crib is from Buy Buy Baby and it is the Princeton Collection! What a cute little family and house! !